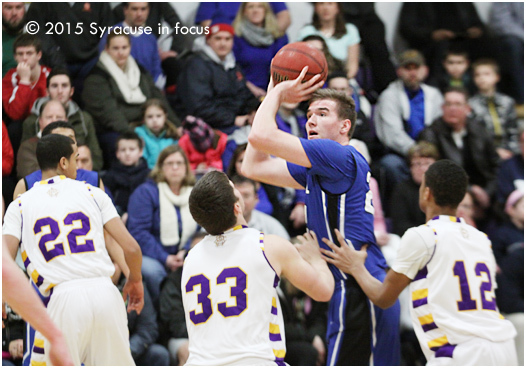 Westhill Forward Tyler Reynolds goes for two of his game-high 23 points. There was a lot of hype for the Westhill v. CBA matchup last night,but it was Westhill who quickly seized control and went up by double digits in the first quarter. 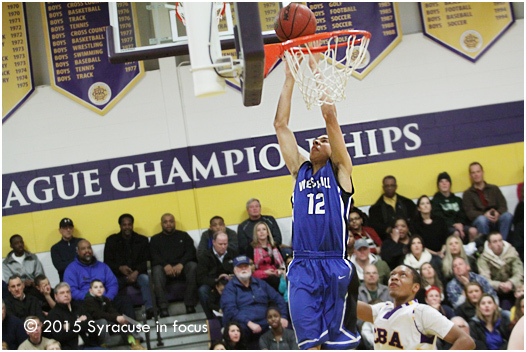 Jordan Roland and Tyler Reynolds led the Westhill attack with 16 and 23 respectively. Westhill won 65-51. CBA was led by Dan Damico with 15 and there were some timely buckets by Monte Stroman and Charles Pride, but Westhill essentially dominated this Section III matchup from the opening tip. 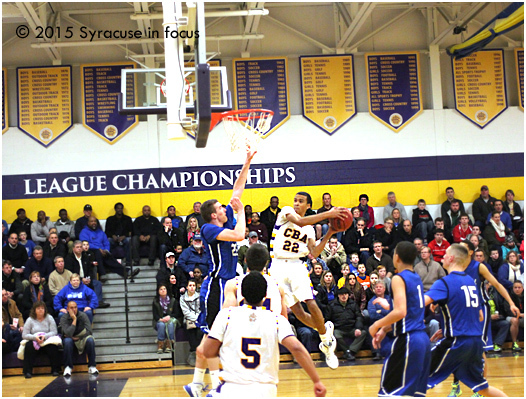 CBA guard Monte Stroman hit three-three pointers but tried to take the ball to the bucket more in the second half. Jordan Roland finished with 16. 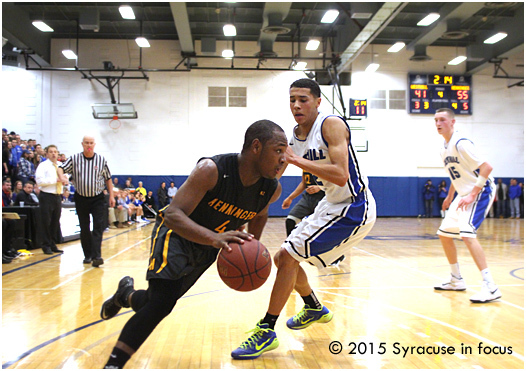 Henninger point guard Romero Collier (4) blows by Jordan Roland in yesterday’s game versus Westhill. There can only be one number one team. Henninger took control of Saturday’s highly-anticipated Section III battle with Westhill early using hustle plays and rebounding. They reduced the Westhill dyamic duo of Roland and Reynolds to a solo show by Roland (who finished with 31). The final score was 59-48. 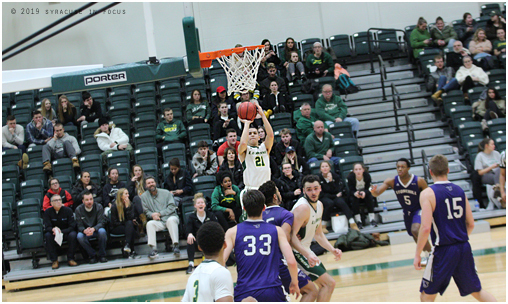 The game was held at Onondaga Community College (OCC). 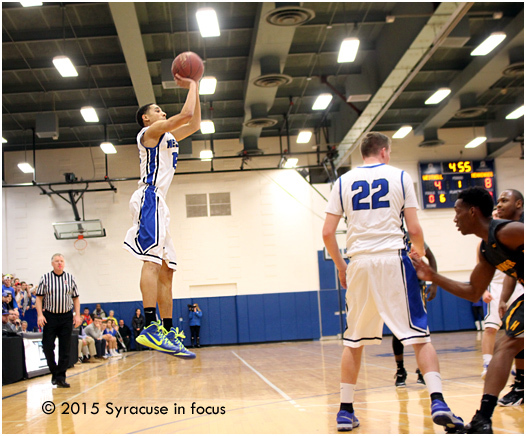 Jordan Roland hits a three-pointer in the first half. He finished with a game-high 31 points. 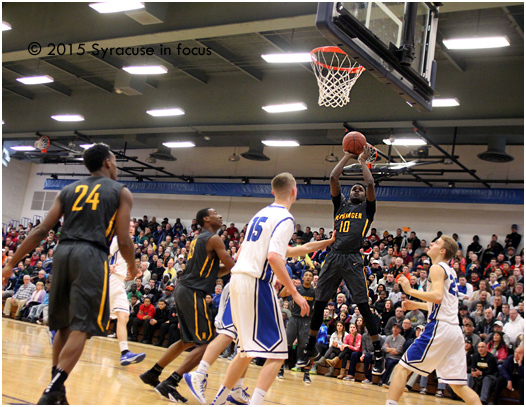 Keisean Scott gets a put back in the third quarter. 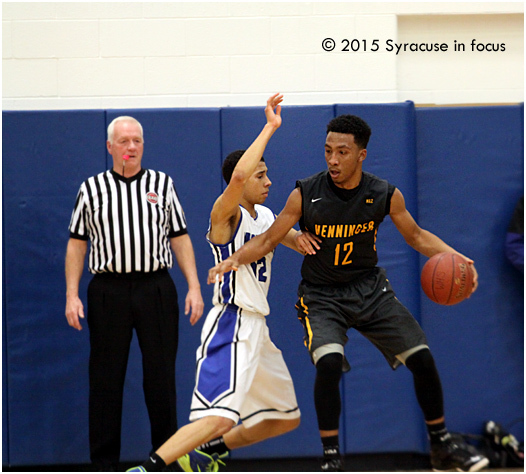 Henninger’s Shaitique Blatche carves out some space in the post during the first half. He finished with 17 points.